Wolves host Tottenham live on Sky Sports this Saturday, having already shared the spoils with both Manchester clubs this season - but how did they do it? And can they halt another Big Six side this weekend? Brighton goalkeeper Mat Ryan made seven saves as Wolves fell to a second successive defeat on Saturday, having lost 2-0 to Watford the previous weekend. But despite the blip, Nuno Espirito Santo's side have adapted remarkably to top-flight football, sitting 10th in the Premier League table with just nine goals conceded - a stark contrast to the 28 shipped by fellow newly-promoted Fulham. Wolves are undefeated against any of the 'Big Six' sides this term, having held Manchester City to a 1-1 draw at Molineaux in August, and achieved the same result at Old Trafford the following month. 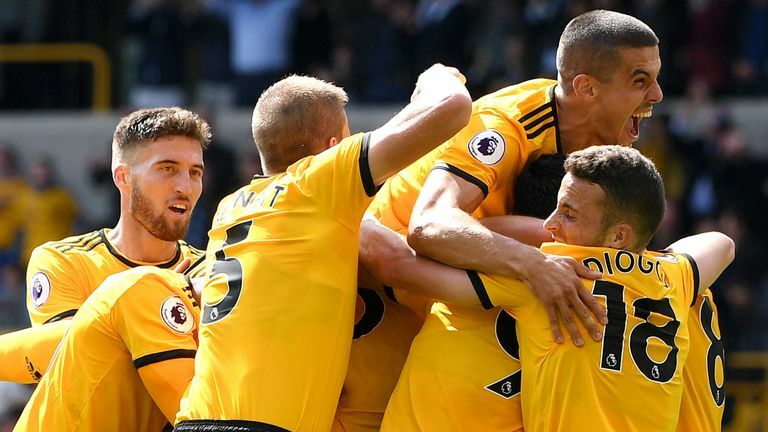 Wolves raised eyebrows in August by earning an exciting draw with the reigning Premier League champions. City struck the woodwork twice before Willy Boly put the hosts ahead - with the help of his arm - and, although Aymeric Laporte levelled with a powerful header, Wolves held on for a morale-boosting point. Wolves set up in a 3-4-3 formation, with front three Jimenez, Diogo Jota and Helder Costa sinking deep to stifle City's midfield - creating an inverted defensive triangle - with midfielder Ruben Neves sweeping up in the central defensive region. In possession, Wolves primarily advanced from defence down the flanks. Without the ball, they forced City's wide men into central areas - with Ryan Bennett and Matt Doherty nullifying Raheem Sterling and Benjamin Mendy down City's potent left channel. Right wing-back Doherty was the primary outlet, recording a team-topping 20 passes in City's half, and combined effectively with Joao Moutinho - while Boly, Jonny, Neves and Jota linked successfully down the left flank. Costa ended up being Wolves' most advanced player down the right, with numerous runs exposing City's rampaging left-back Mendy. The graphic below shows how City dominated the game, with Wolves only recording a superior number of passes during two three-minute intervals towards the end of both halves. In addition to Boly's goal being incorrectly given, it came against the run of play after Pep Guardiola's side had dominated the first 15 minutes of the second half. In attack, City dwarfed Wolves across a raft of stats, including shots, chances created, dribbles crosses and touches in the opposite box - firing 18 attempts at Patricio's goal, of which six were on target and two hit the woodwork. Wolves had to be clinical with limited chances, which were primarily created by Jota and Moutinho. Boly's controversial goal was one of only two shots on target - the other coming when Costa's shot was palmed wide by Ederson. In terms of general play, unsurprisingly, Guardiola's side controlled possession with 644 passes compared with just 260 attempted by the home side. Neves was busiest for Wolves, attempting a team-topping 34 passes - 23 in his own half - while also winning a team-topping four tackles and making two blocks. Wolves' success was achieved with rearguard effectiveness, which bears out in their league form: their impressive defensive record of only shipping nine goals countering a relatively poor return of nine goals scored. Nuno Espirito Santo's side were superior across a raft of defensive metrics, including tackles, blocks, interceptions, clearances and saves - which would be expected when on the back foot, but their efficiency ultimately earned the draw. So, Wolves achieved the result from a fair share of good fortune, defensive efficiency, counter-attacking with Costa, Neves breaking City's flow in defensive midfield and advancing with wing-backs Jonny and Doherty, while forcing City's wide players infield. Highlights from Man Utd's 1-1 draw with Wolves in the Premier League. One month later, Wolves held the red side of Manchester to another 1-1 draw. After David de Gea was forced into making two early saves, United broke the deadlock in the 18th minute with summer-signing Fred opening his account for the club from range. While Paul Pogba had been instrumental in Fred's opener with an initial feigned pass, the France international was culpable in the build-up to Wolves' equaliser, being easily dispossessed before Jimenez teed up Moutinho. Wolves again lined up in a 3-4-3 formation against United's 4-3-3. United's average positions were surprisingly defensive, while Andreas Pereira (No 15) recorded more touches than the ineffective Romelu Lukaku (not shown on graphic below) - despite replacing the Belgian with just 15 minutes left on the clock. In contrast to their contest with City, Wolves matched United for attacking intent, with an equal number of players averaging positions in the opposition's half. Neves and the more advanced Moutinho proved effective as the distribution engine. Once again, Wolves' build-up combinations were almost exclusively down the flanks - before feeding the central midfield duo. Again, the graphic below shows how Nuno's side sustained long periods of United pressure without conceding. Wolves scored during a period of inferior dominance, as they did against City - suggesting their counter attacks were a key component to both results. Wolves almost matched United in attacking stats, marginally edging Jose Mourinho's side for shots on target, shooting accuracy and dribbles attempted, while creating an equal number of chances in front of goal. Nuno's side achieved far greater dominance at Old Trafford than they had against City, but were still out-passed - attempting 379 passes compared with United's 684. Again, Neves and Moutinho controlled central midfield with 88 passes combined, while the front three each recorded in excess of 40 passes. Wolves' defensive robustness paid dividends, recording considerably more blocks, clearances and interceptions than their hosts. Conor Coady and Romain Saiss both blocked two attempts on goal, while Ryan Bennett made a team-topping seven clearances. Wolves rightfully earned a draw at Old Trafford from a positive, attacking approach, epitomised by each of their front three and central midfield duo hitting a shot on target - four of those also created two chances on goal. Nuno will want to replicate his success against the Manchester clubs when his side host Tottenham on Saturday. Having proven they can sustain pressure, Wolves are likely to sit deep, advance from defence via the wing-backs, rely on their pivotal midfield pairing to feed the front three and hit Spurs on the break. Can Wolves yield points from their third successive 'big six' opposition? Watch Wolves vs Tottenham live on Sky Sports Premier League from 7.30pm on Saturday.